Is a Cloud-Managed Network right for your Schools? Cloud networking solutions offer a great way to manage the growing demand of high-bandwidth campus Wi-Fi when resources and funds are scarce. However, not all cloud-based solutions are equal. 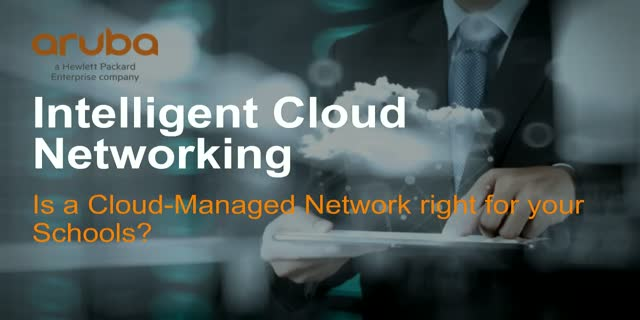 Join us for a live webinar to learn what to expect from a cloud-managed network, how to avoid common pitfalls, and how to get E-rate-ready 5-year network management licensing. We will also show the benefits of Aruba’s cloud solution for K-12, along with a live demo! Title: Is a Cloud-Managed Network right for your Schools?